The panels located above the public pass through on Poultry are the original friezes taken from a demolished building (12 - 13 Poultry) that once stood close to their current location. Created by the sculptor I.C. 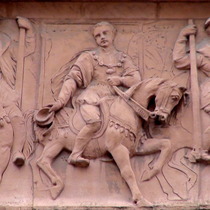 Kremer in 1875, each frieze is made from up to 10 pieces of terracotta (unglazed fired clay) and fitted together to complete the final frieze. Each frieze depicts a procession that once went past the site. 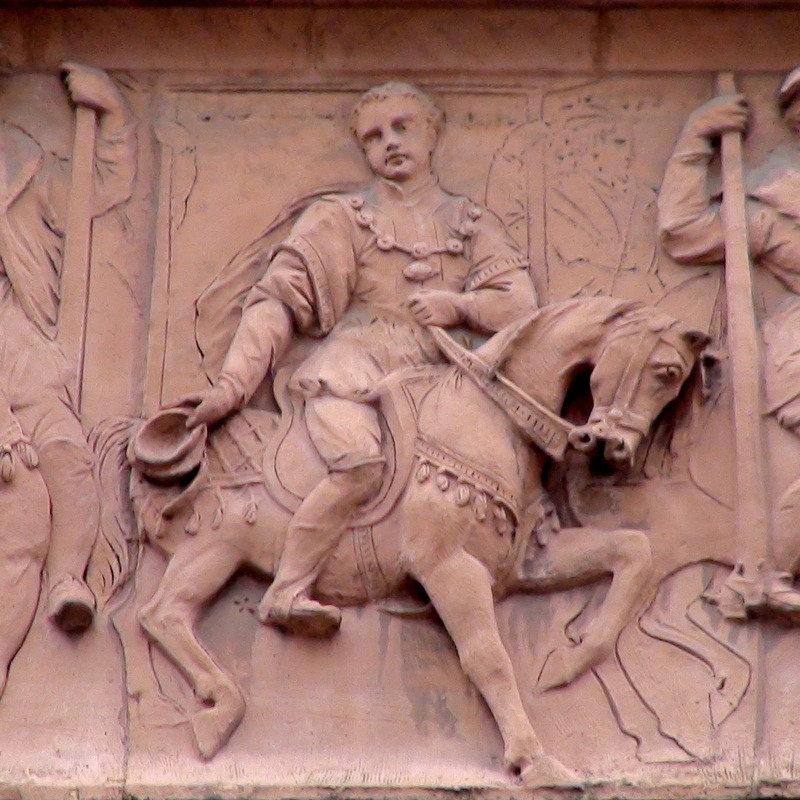 Panel A depicts King Edward VI. Panel B Queen Elizabeth I. Panel C King Charles II. Panel D Queen Victoria. With the financial support and vision of Lord Palumbo and Dieter Bock and the guidance of the corporation of London the friezes are a memory of the past and inspiration for the future. These panels were originally placed as spandrels between the floors of a building in Poultry. During the mid-Victorian era the stonemasons were the coal miners of their day and went on strike so the panels were manufactured in terracotta rather than carved in red sandstone as the rest of the building, and in Belgium as a way of breaking the strike. Ornamental Passions has pictures of the whole of this frieze, displayed as they were originally: one of top of the other. And Spitalfields Life has a photo of Frieze D showing the windows above and below. The incorporation of these panels into the new building was part of the listed building demolition consent, 7 June 1989. Tony Tugnutt, who was the planning case officer for the two public inquiries had to find a suitable location on the new building and supervise their removal and restoration. The architects from Stirling Wilford suggested round the back by the service entrance but Tony persuaded them that they should be located on the Poultry frontage where they had always been and over the main entrance, Tony's view being that they fitted into the design and actually enhanced the monumental new building.